It was going to happen eventually. Eventually I would crack and read the book that seems to have been universally praised. So here you go, a review for A Game of Thrones. Is it worth the hype? So, the story. 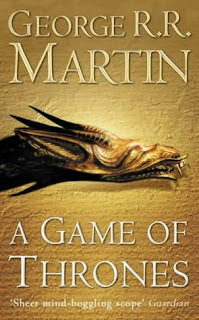 The story focuses largely on power struggles in the court of King Robert Baratheon, with lines being drawn between Lord Eddard Stark, the king's best friend and chief advisor, and Cersei Lannister, the queen and mother to Robert's heirs, as well as their respective families. At the same time as the power struggles there are occurring, the last heirs of the previous king, Aerys Targaryen, are living across the sea, plotting to regain the throne that their father was deposed from. That is the story at it's most basic. I shan't be giving any real details here, for fear of spoilers; the reason that I don't want to spoil this is that this is an incredibly well-written plot, one which I think should be experienced first-hand. There is so much that actually happens because of the different characters' subterfuge, that I couldn't give you an impression of the skill that this is brought together with. The one thing that I would mention is that I personally thought that the focus could have been more on Daenerys and her brother overseas, as it involves a more interesting setting than the main plot, which is pretty much just your standard medieval-Europe-style fantasy setting. In terms of characters, there are a ton of them. So you're pretty much guaranteed to have your personal favourites and people you hope will meet a sticky end. Overall, I thought the character-building was pretty good. 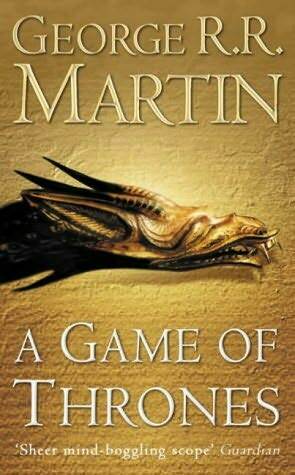 My only real problem was with the Lannisters, the main villains of the book. This is very much a personal thing, but I believe that a good villain needs to be entertaining as well as evil enough to make me wish for their defeat; the Lannisters have plenty of the latter, but none of the former, unfortunately. The only exception to this is Tyrion Lannister, the dwarf character. In contrast to the rest of his family, he has to manipulate the situation to his advantage, working for his rewards because of his disadvantages; in comparison, the rest of the Lannister family is just kind of boring, as they've become so sure of their power that they've devolved into using tactics worthy of the average playground bully. That is, of course, a very subjective point, but it's something that I thought I would mention.